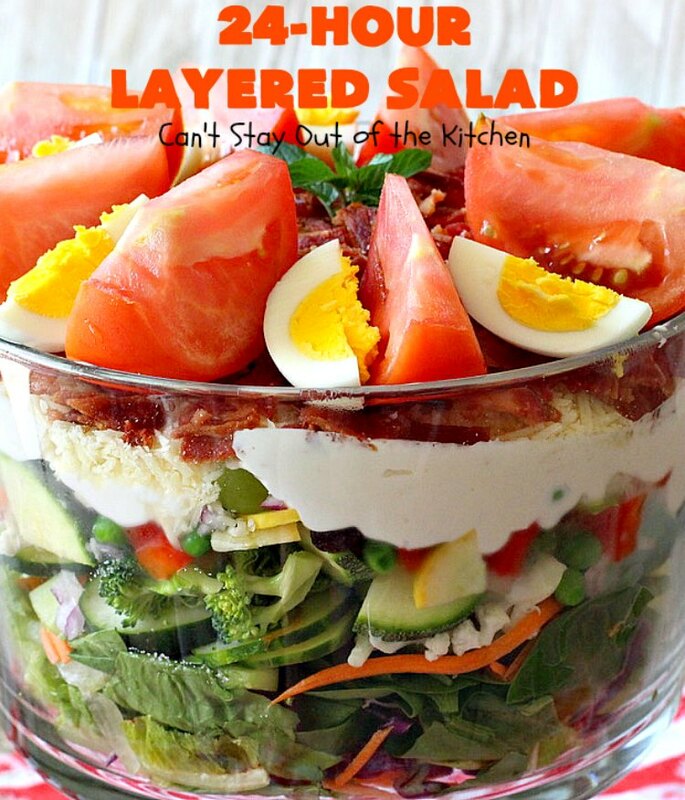 This fantastic salad includes all the traditional stuff from a Seven-Layered Salad. But it also has tomatoes, hard-boiled eggs, broccoli, cauliflower, zucchini, carrots, yellow squash, colorful bell peppers and cucumber. I also include raisins and green grape halves. I got that tip compliments of Carolyn Allen who I used to cater meals with back in New England years ago. 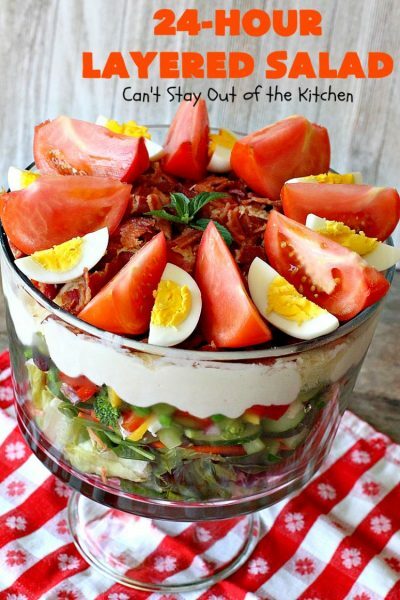 We made layered salads regularly for events because you could make the salad the night before serving. Everyone always loved this great recipe. She’s the one that encouraged me to play around with the recipe to add more stuff. 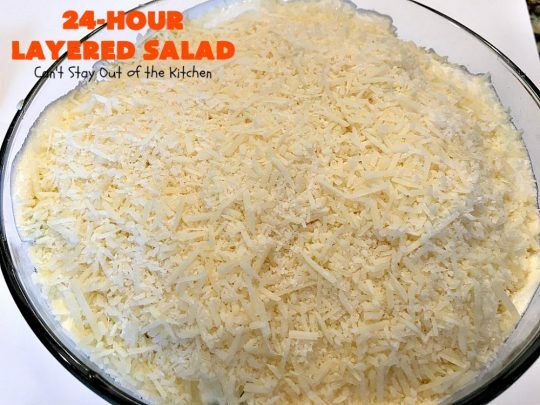 24-Hour Layered Salad is yummy, delectable and so satisfying that you won’t want to stop eating it! I usually spread the dressing on the top of the salad like I’ve shown in the pictures, but you can also make up the salad without the dressing and pour it over top of the salad when you’re ready to serve it. The nice thing about this salad is you don’t have to be exact on the ingredients. You cut up as much as you need for the container you’re going to make it in. Or, you add more of ingredients your family especially likes. If you’re looking for a creamy, cheesy, bacony salad chocked full of fresh veggies, this one is perfect. Our guests raved over this salad when I made it a week and a half ago for dinner. If you’re stuck in the rut of only making 7 layers for your layered salad recipes, then consider making a 20+ layer like mine the next time you have company or want to take a salad to a potluck gathering. It’s a great way to use up garden produce, and I’ve even used chopped radishes, garbanzo beans (chickpeas), water chestnuts and other veggies at times. 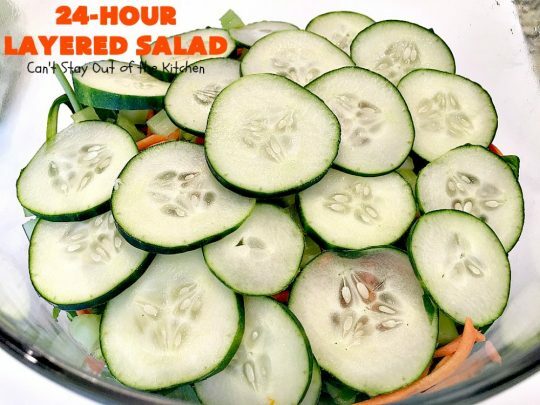 Just remember, the salad needs to be eaten no longer than 48 hours after you make it. So unless you’re making it for company you may want to cut down on amounts so you don’t have too much. This recipe calls for freshly grated romano cheese which is a really nice change to the standard cheddar cheese. 24-Hour Layered Salad is also gluten free if you make sure that your bacon is gluten free. 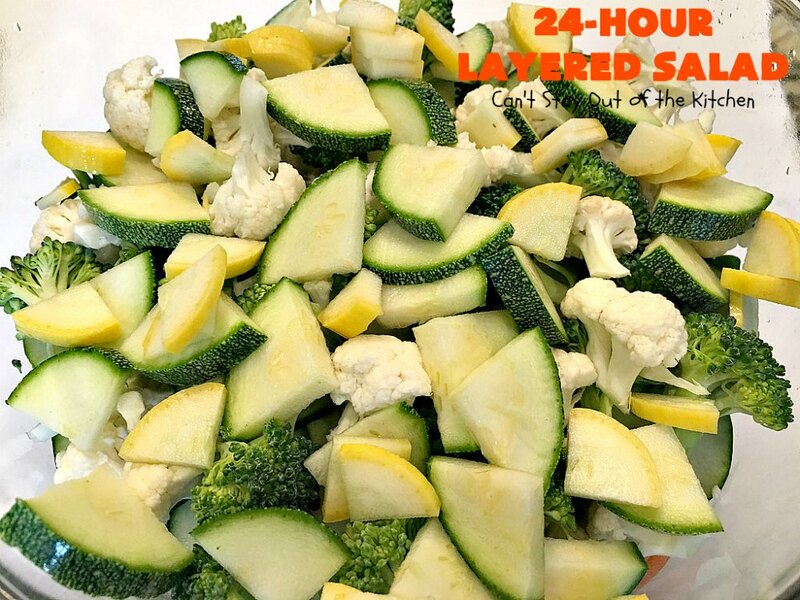 No matter what veggies you have on hand, everything seems to work in this recipe–everything BUT the kitchen sink, that is! I initially posted this recipe in September 2013. I made it with a salad dressing that was based on Greek yogurt and zylitol. While that dressing was good, I decided to go back to the original recipe this time I made it (May 2018). I found a Miracle Whip without High Fructose Corn Syrup. (Yay!) However, I sure wish they’d make it with good oils like avocado oil instead of GMO soybean oil. 🙁 Anyway, I combined it with sour cream. Then after spreading over top of the salad ingredients, I sprinkled sugar on top. Then I sprinkled freshly grated Romano cheese. 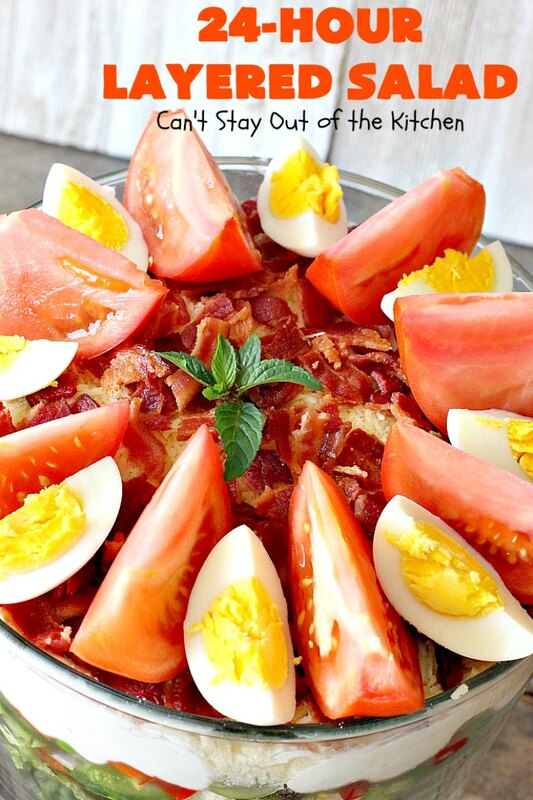 Finally, I topped it with bacon, hard-boiled eggs and tomato wedges (like in the previous post). 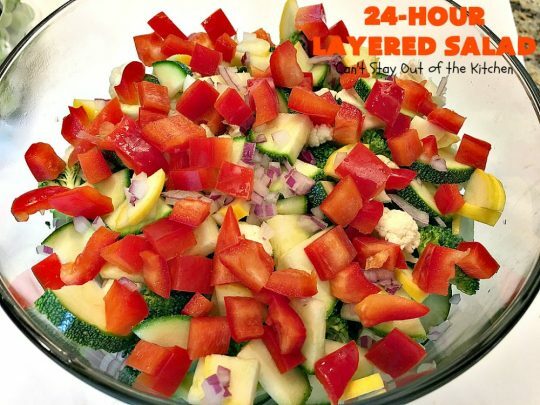 24-Hour Layered Salad is filled with all kinds of wonderful veggies. Here’s a view of the top of the salad. 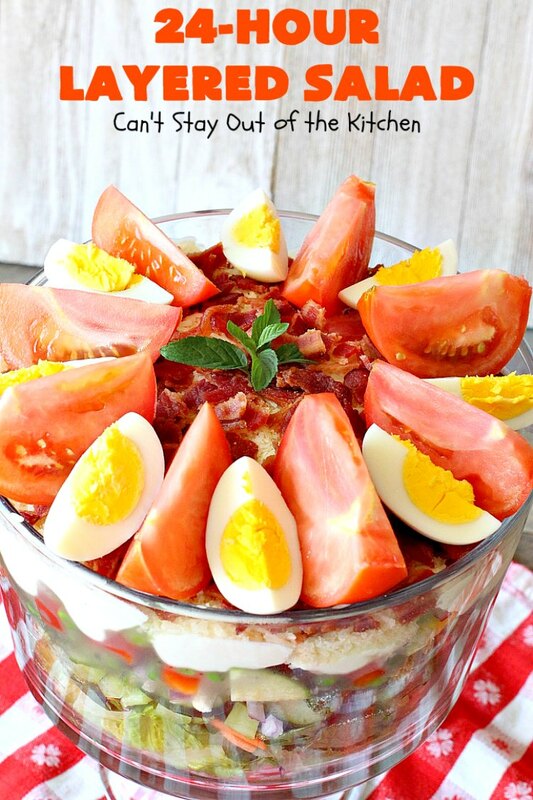 You can see the bacon and romano cheese peeking out underneath the hard-boiled eggs and tomatoes. 24-Hour Layered Salad is one of my favorite salads. I’ve enjoyed this recipe since the late 70s. 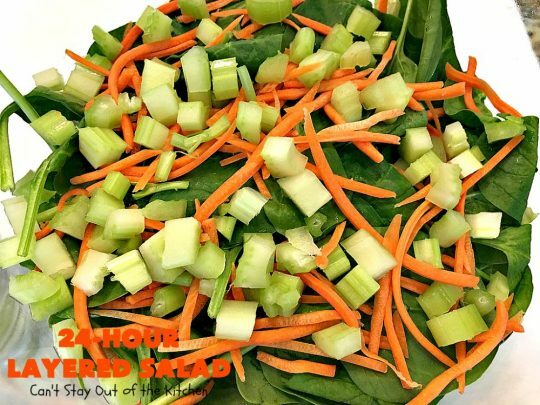 This amazing salad is filled with everything but the kitchen sink! I used these ingredients for the salad. I decided NOT to use the water chestnuts this time. Place baby spinach spring mix in a trifle dish. 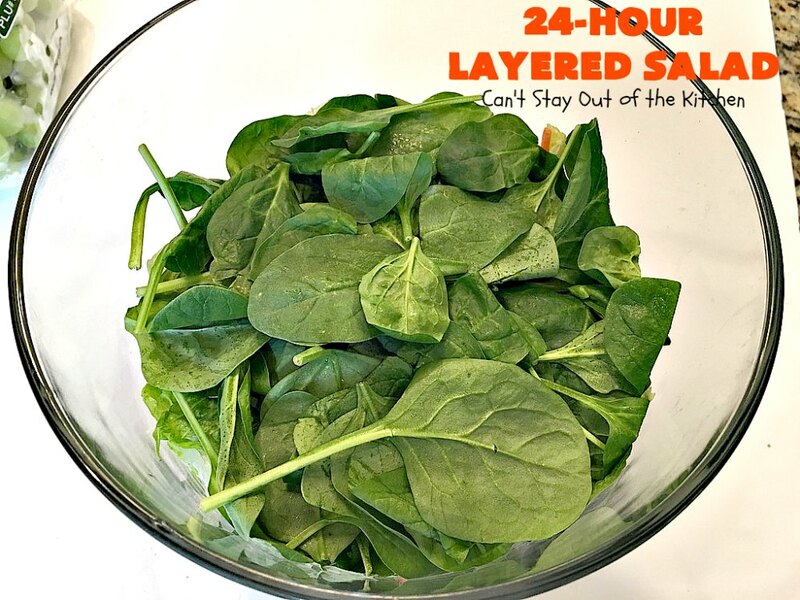 Top with spinach leaves. Add grated carrot and diced celery. Add broccoli and cauliflower florets. Add diced zucchini and yellow squash. Add finely diced red onion and diced red bell pepper. Add frozen peas and raisins. I used these ingredients for the salad dressing. 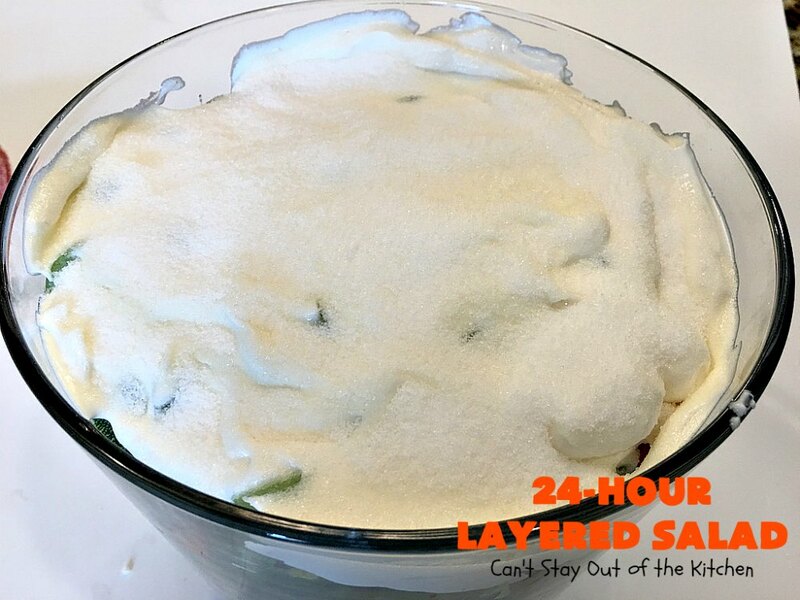 Place Miracle Whip and sour cream in a mixing bowl. I found a Miracle Whip without High Fructose Corn Syrup so I purchased that. 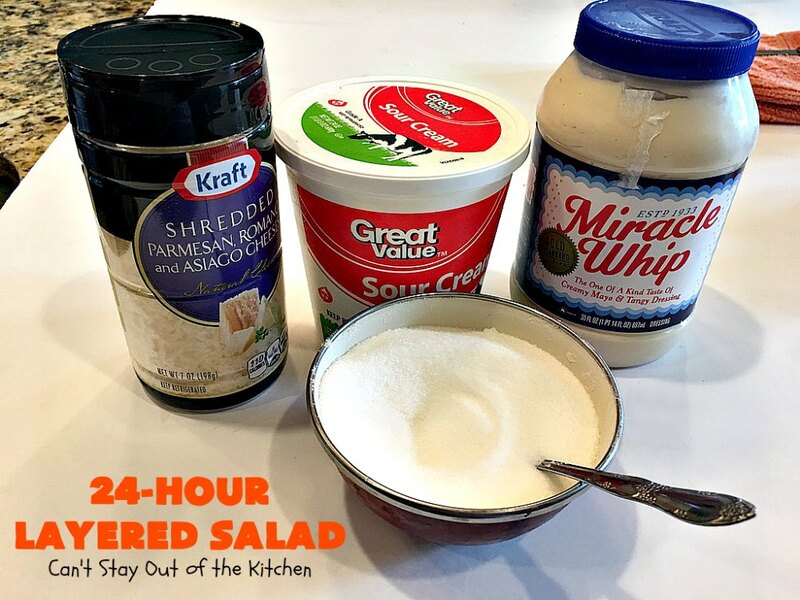 Combine Miracle Whip and sour cream and spread over top of salad ingredients. 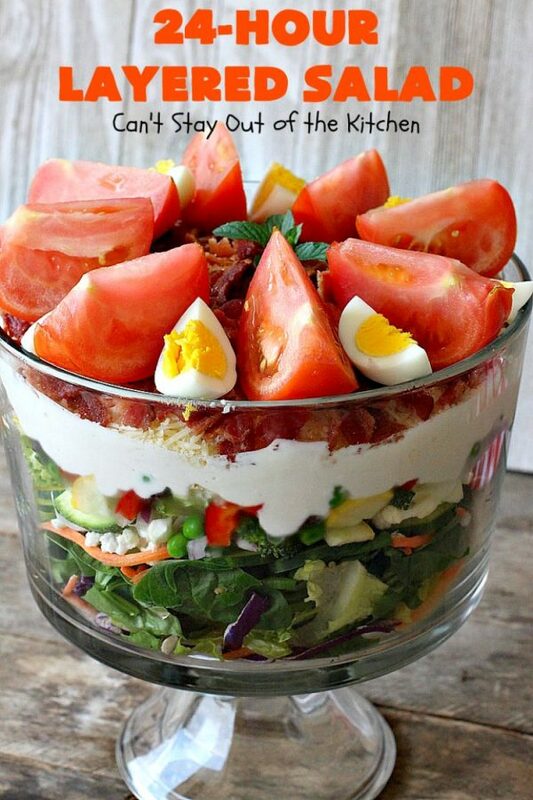 Add crumbled crisp-fried bacon, tomato wedges and hard-boiled eggs. Refrigerate salad several hours or overnight. To serve, use salad tongs and dig to the bottom of the trifle dish to get to the lettuce! 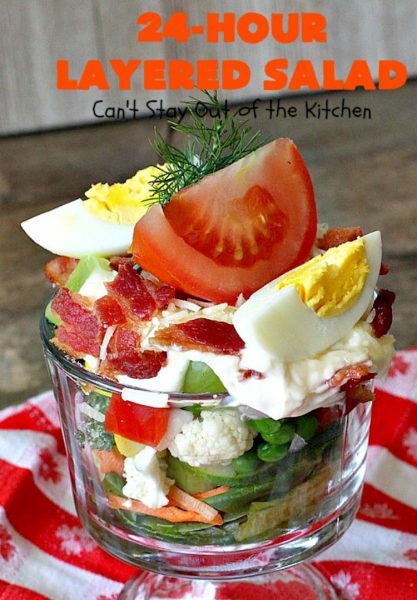 You can also make this salad in individual parfait dishes. Obviously, the amount of salad ingredients, salad dressing ingredients and toppings will be significantly reduced. 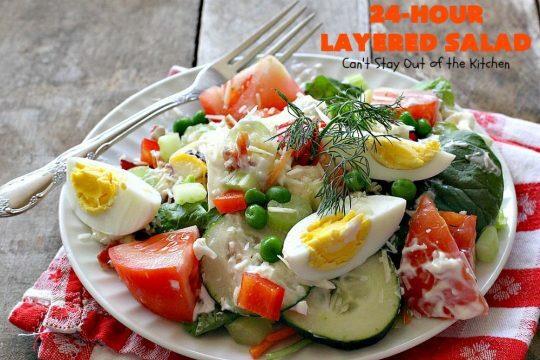 If you enjoy a Layered Salad, this 24-Hour Layered Salad should be on your bucket list this summer! This fabulous 24-Hour Layered Salad is spectacular! 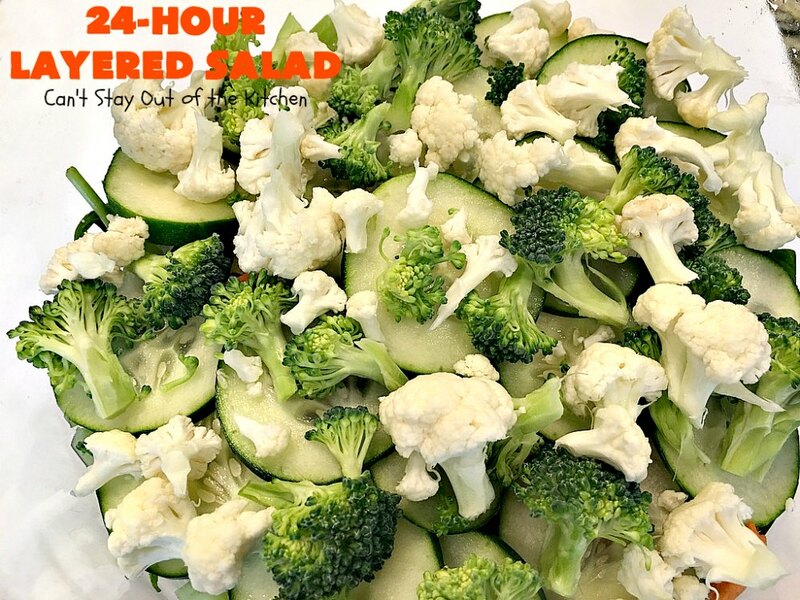 This salad includes several layers and is totally awesome for potlucks, backyard barbecues and summer holidays like Father's Day, Fourth of July or Labor Day. Everyone loves the flavors of this incredibly delicious salad. 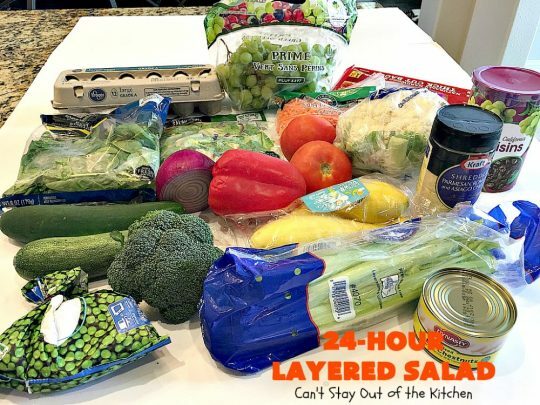 Layer spring mix, romaine, carrots, celery, red pepper, squashes, cucumber, cauliflower, broccoli, peas, grapes, and raisins in a very large salad bowl or trifle dish. Combine sour cream and Miracle whip and spread over top of salad. Sprinkle sugar over top of Miracle Whip mixture. Sprinkle Romano cheese over top of sugar layer. Crisp fry bacon then spread bacon pieces over top of Romano cheese layer. 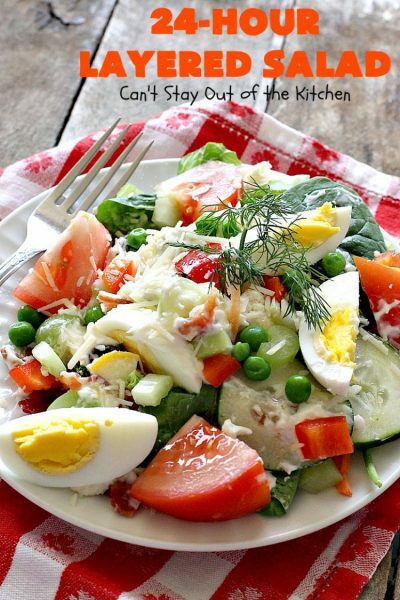 Arrange tomatoes and hard-boiled eggs over top in whatever design you prefer. NOTE: This is a great salad to take to a potluck because you can make it the night before you need it. 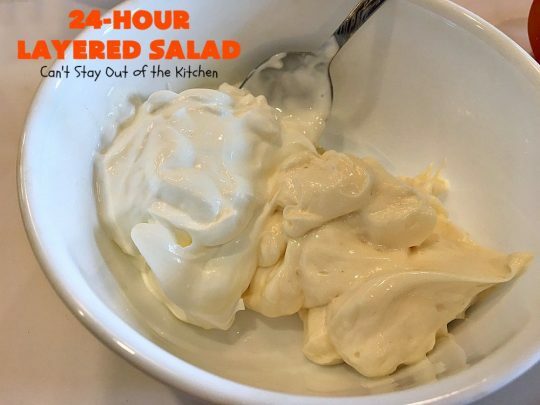 But it needs to be eaten within two days, so if you can’t eat this much in two days, and you’re not having company to help you eat it all, you may want to cut the recipe in half or leave off the salad dressing and portion it out individually. Fabulous salad that you can prepare the night before you need it. 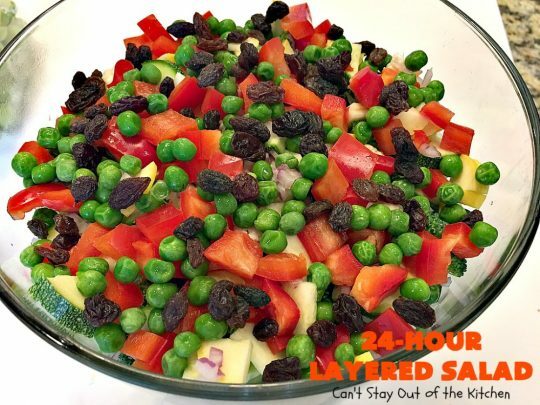 Originally a take-off on the Seven Layered Salads, this one has about 24 layers and includes grapes and raisins to give it a little bit of sweetness. Layer spring mix, romaine, carrots, cabbage, celery, red pepper, squashes, cucumber, cauliflower, broccoli, peas, water chestnuts, grapes, and raisins in a very large salad bowl. Partially prepare Healthy Italian Yogurt Dressing: Mix dry Italian dressing mix with yogurt. Spread over top of the salad. Sprinkle with Xylitol, (or sweetener of your choice) then Romano cheese, then bacon pieces. This is a great salad to take to a potluck because you can make it the night before you need it. 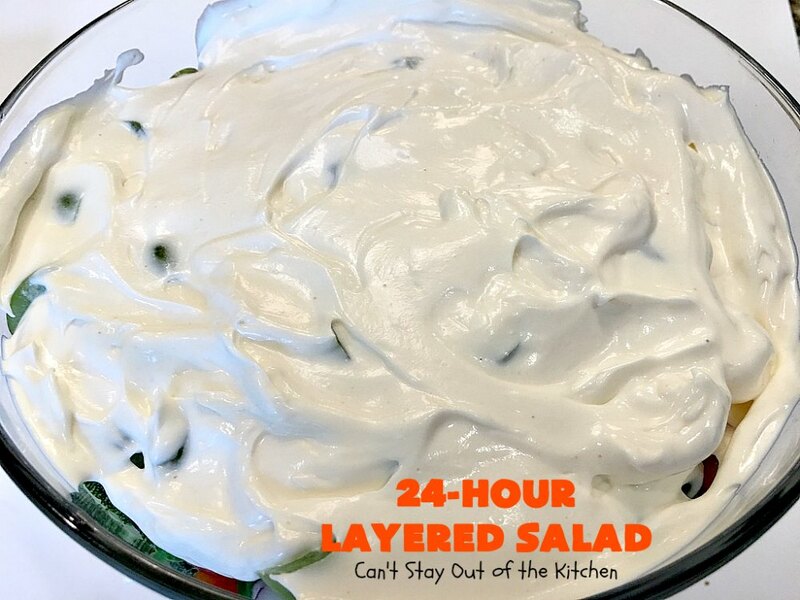 But it needs to be eaten within two days, so if you can’t eat this much in two days, and you’re not having company to help you eat it all, you may want to cut the recipe in half or leave off the salad dressing and portion it out individually. [br][br]If xylitol is not the sweetener of your choice, substitute Splenda, Truvia, or even honey. If using honey, mix it with the dressing in the amounts you desire. 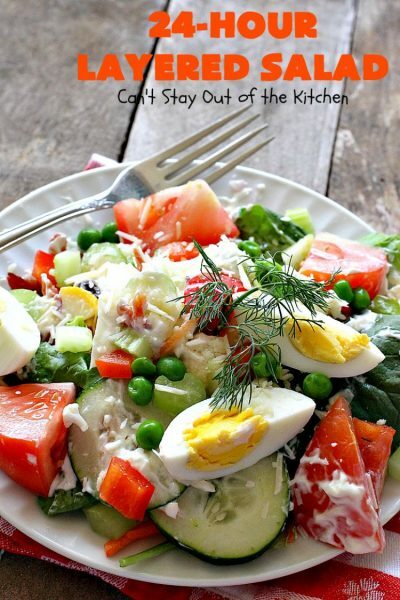 [br][br]This salad actually tastes the [u]best[/u] when using Miracle Whip and sugar for the salad dressing. But I provide these alternatives for those who are on a low sugar diet or need healthier options. Healthy homemade salad dressing made with Greek yogurt. Mix ingredients together and spread over Healthy 24-Hour Layered Salad recipe during the layering process. 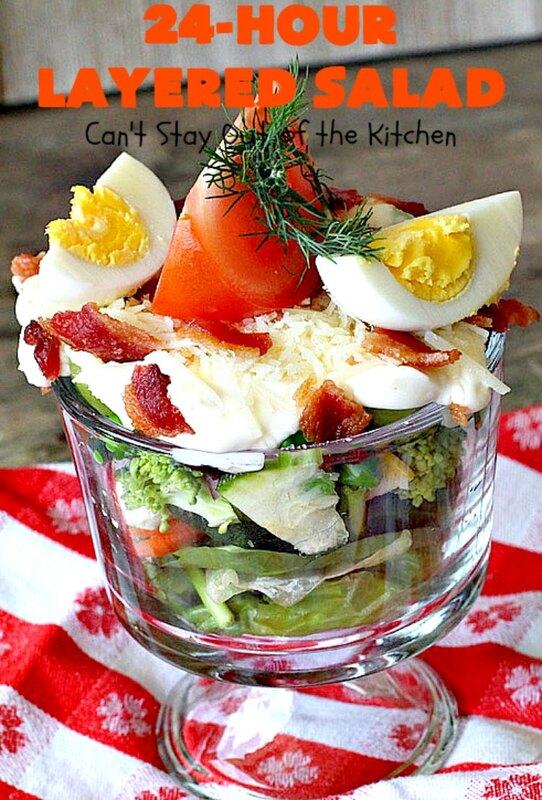 Or set aside and spoon over servings of layered salad as you desire. I also recommend serving the salad dressing separately. Mix yogurt, dry Italian seasoning mix and xylitol (or your favorite sweetener, or honey. Refrigerate. After layering raisins then sprinkle the salad with Romano cheese, bacon, and arrange tomatoes and hard-boiled eggs over top. Refrigerate. When ready to serve, dish out individual portions of salad and pour the Healthy Italian Yogurt Dressing over top. [br][br]The original recipe calls for 2 cups Miracle Whip or Hellmann’s Mayonnaise and 2 heaping tablespoonfuls of sugar. If you are not concerned about eating either of these items, they really taste [u]better[/u] than Greek yogurt and xylitol. 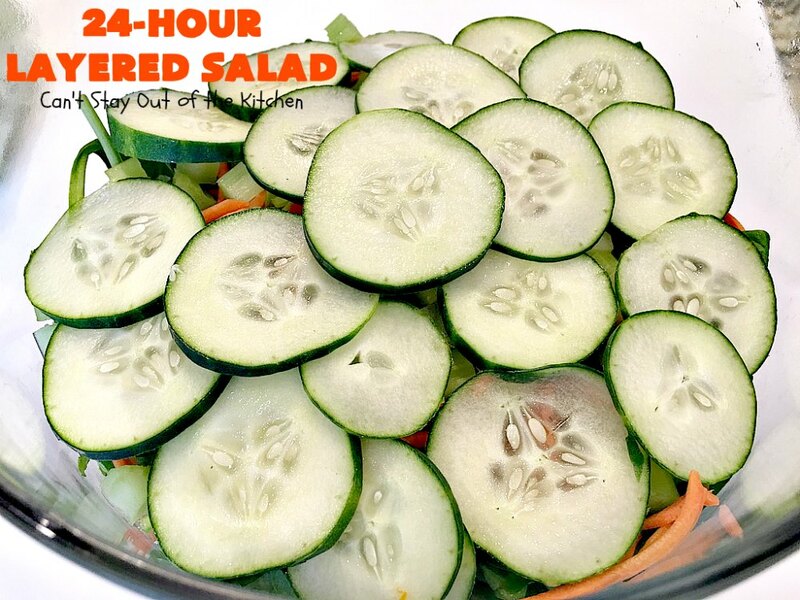 This salad is a fabulous way to use up garden produce or lots of veggies from your CSA. Every bite of this scrumptious salad is delectable. This salad is yummy! 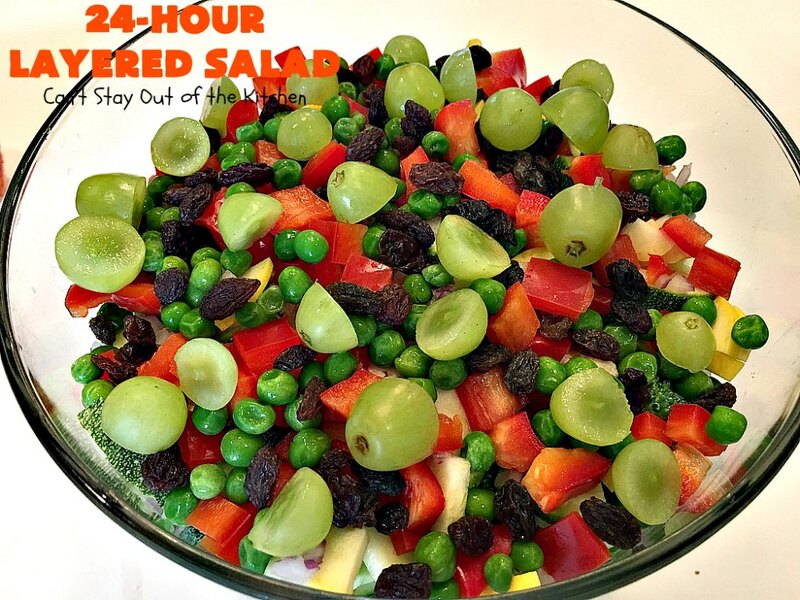 The grapes and raisins add a little sweetness to this salad. It’s hearty, filling and totally satisfying! Plus, it’s gluten free if you use gluten free bacon. Oh my goodness, yum! I want some!